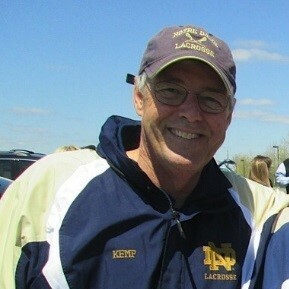 A weekend celebrating the life of Notre Dame lacrosse parent Bob Kemp concluded Sunday with the Irish unofficially defeating Navy 15-9 at Georgetown Preparatory School in Bethesda, Maryland. Spectacular sunshine and vintage fall foliage served as the backdrop for the inaugural, two-day Bob Kemp Lacrosse Classic. The event aims to capture Bob’s legacy, honoring those with a notable commitment to faith, family and athletics. Proceeds from tickets, a silent auction and sponsors covered the cost of a scholarship at Washington Jesuit Academy in Bob’s name. The academy, founded in 2001, serves students from low-income communities in grades 5-8 in the Washington, D.C., area. All WJS students attend on full scholarship. 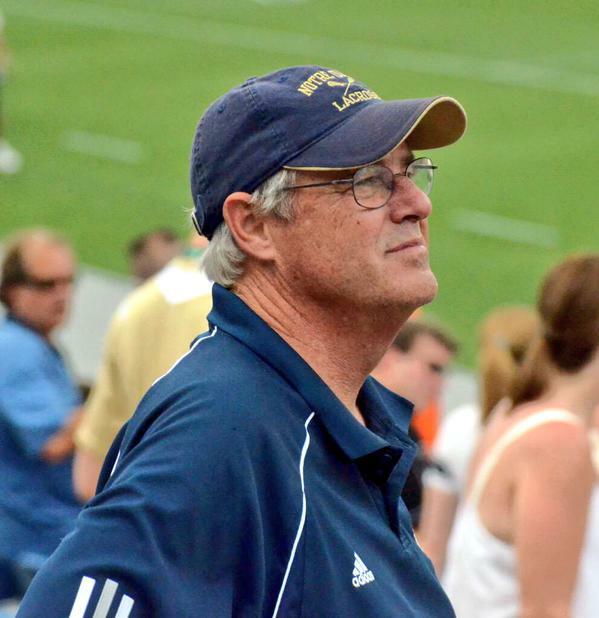 Bob and Cheryl Kemp have seven children, all of whom played high school sports. Rob was a baseball player, while sisters, Julie, Erin and Liz were accomplished swimmers. The three youngest boys were lacrosse players, all goalies. All three attended Georgetown Prep en route to earning collegiate All-American honors. Two of those goalies, Joey and John, attended Notre Dame. CJ played at Fairfield. Bob played football for Lou Holtz at William & Mary. The Notre Dame lacrosse team arrived in the nation’s capital on Saturday, visiting The Newseum, which displays the history of news through the eyes of the media. A brief networking event with local alumni followed. 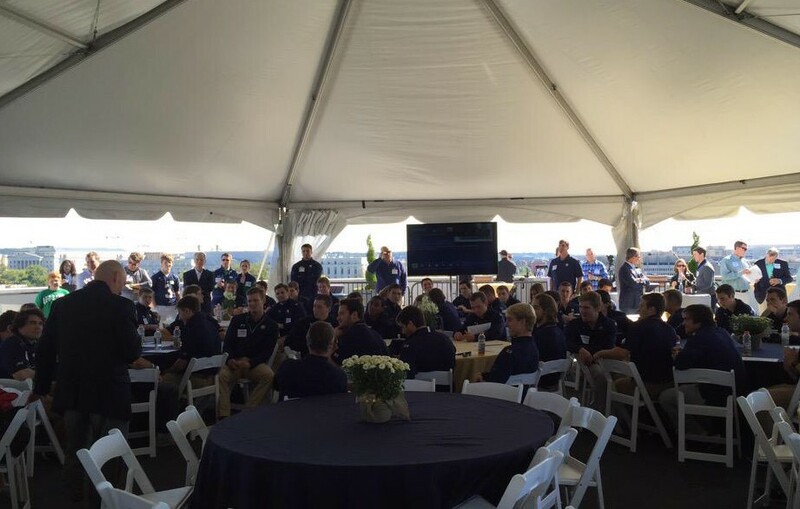 In the afternoon, the boys joined a sold out crowd at The Terrace at 101 Constitution Avenue, where a Penthouse layout provided a spacious venue for players, parents and alums. 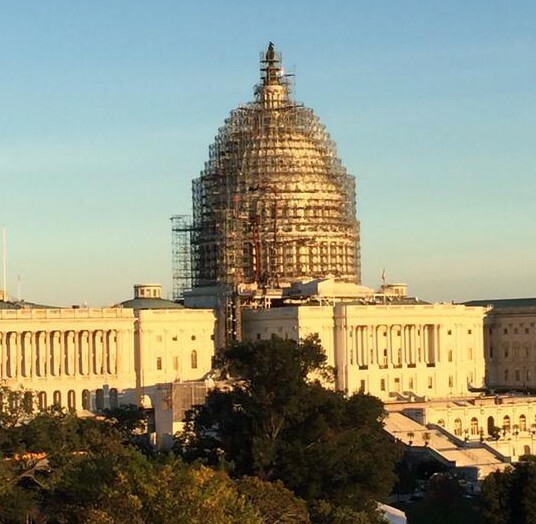 The Terrace also provided a spectacular view of the nation’s capitol and the surrounding streets, overflowing from the 20th anniversary of the Million Man March. A view from The Terrace and the Bob Kemp Classic. The crowds extended from the steps of the Capitol Building a dozen blocks down Constitution Avenue. The open-air Terrace also included large screen televisions displaying the Notre Dame football game against Navy in South Bend. The 14th-ranked Irish pulled away in the second half, winning 41-24. Representatives of The Academy, the Kemp family and Notre Dame coach Kevin Corrigan thanked everyone for their attendance, prayers and generous contributions. 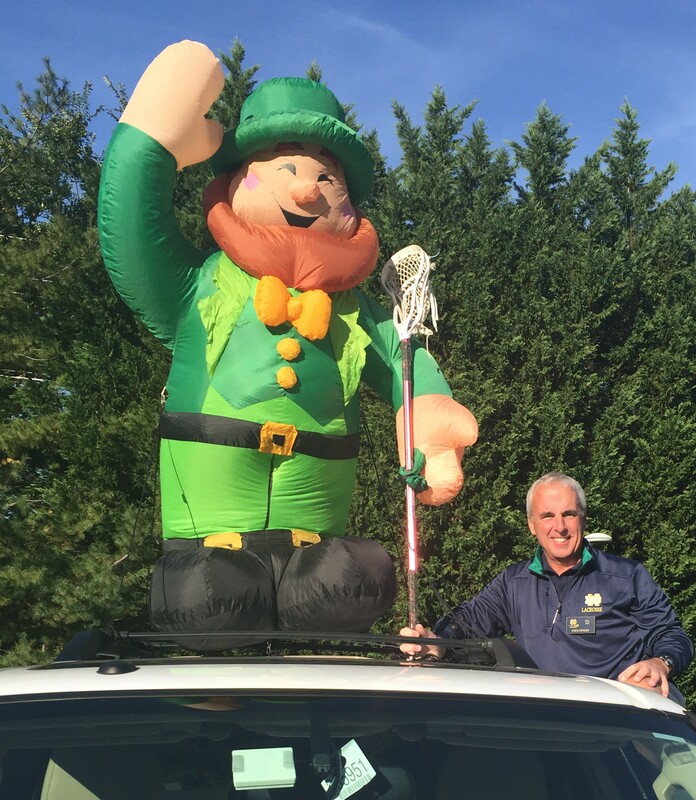 A peaceful, fall Sunday morning at the majestic Georgetown Preparatory School was greeted by a speaker and leprechaun and stream of tailgaters. 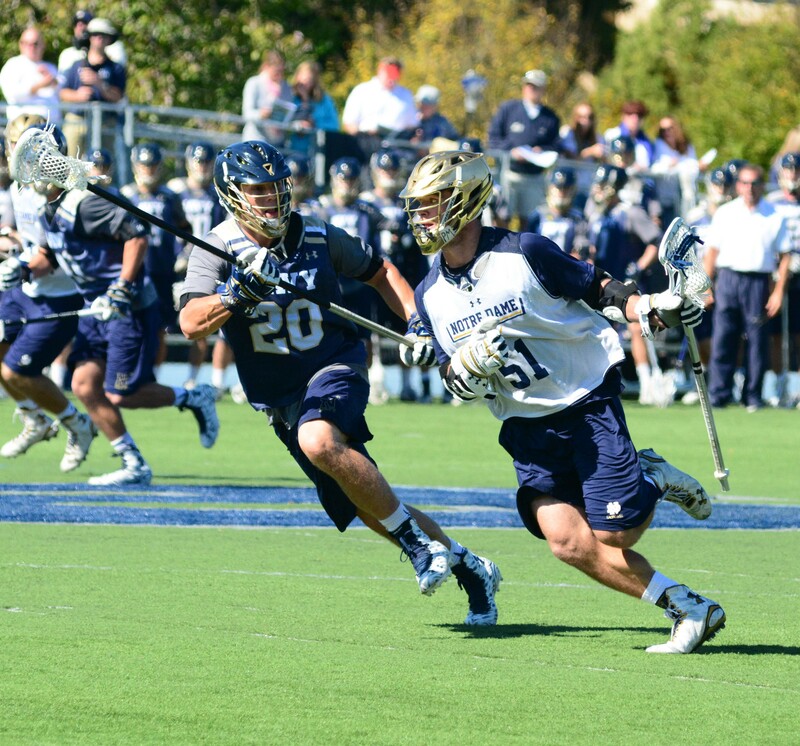 Fall lacrosse and another spectacular, sun-drenched day brought an overflow crowd to see Notre Dame battle Navy. Many thanks to Beth and Ed Lubowicki for the generator-charged Leprechaun and Paul and Liz Finley for the legendary speaker that supplied the music. Those two families along with Bob and Norma Landis organized a successful tailgate. Georgetown Prep dad Steve Collins architected tent city. We had generous supplies of Bloody Mary’s, Mimosas, breakfast sandwiches, fruit and healthy snacks. I may have seen a few beers. Paul Finley and The Leprechaun. The game began at noon, with the announcer confirming the teams had agreed not to post a score. We managed to capture PJ Finely taking the opening faceoff for the Irish, with an attack that featured Mikey Wynne, Eddy Lubowicki and freshman Ryder Garnsey. The defense was quite familiar – seniors Matt Landis and Eddy Glazener, along with Junior Garrett Epple. Midfielders included Sergio Perkovic, Cole Riccardi and Brendan Collins. John Sexton was your long-stick middie with sophomore Owen Molloy starting between the pipes. The lineups were fluid from there, especially at middie where Trevor Brosco, Nick Koshansky and Bobby Collins played stifling defense. Goalie Owen Malloy set the transition in motion in his first start. Navy scored two goals on their first two possessions. We were four minutes into the contest when Brendan Collins put the Irish on the board on a nice feed from sophomore Mikey Wynne. Senior Kyle Trolley then scored, beating his man with a wicked face dodge, to tie the game at two. Junior Ben Pridemore and sophomore Patrick Hadley hit the field for the first time. Goalie Molloy looked poised, making a couple of nifty saves, with quick, crisp outlet passes. Molloy played attack his junior year in high school. Senior Jack Sheridan, junior Pat Healey and sophomore Will Young added depth to the defense. Collins, with help from Ryder Garnsey and Eddy Lubowicki, got his second goal of the game to give their Irish their first lead, 3-2. Senior Bobby Gray then put his patented shot on display, streaking down the left side, shooting high to low, far post to put the Irish up 4-2. With each goal, the Washington, DC-based Notre Dame Alumni Band played the fight song. With an overflow crowd, it had the feel of Arlotta. Navy would answer with a goal to close the first quarter and the Irish leading 4-3. A supportive Matt Kavanagh was on hand and eager to return. Brendan Collins, playing at his alma mater, put the Irish on the board. Nick Koshansky led a very athletic midfield for the Irish. 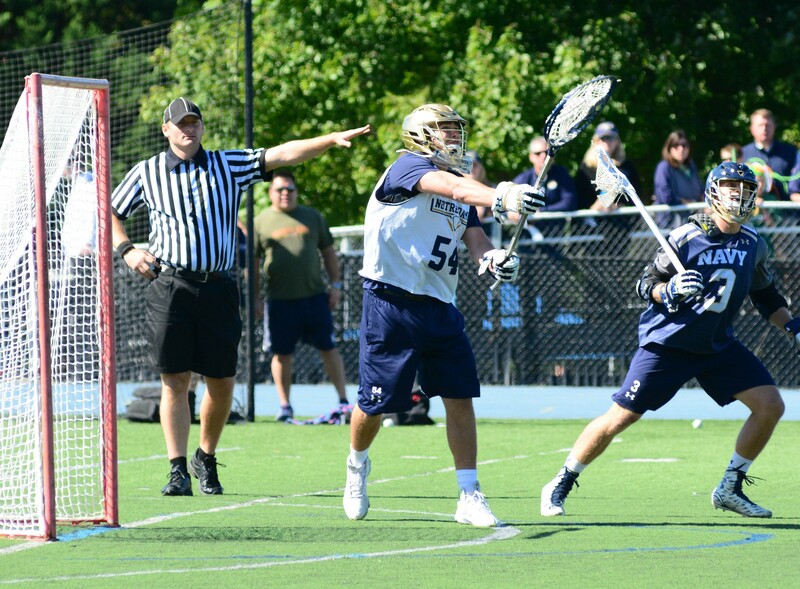 The second quarter began with freshman Garnsey going side arm to put the Irish up 5-3. Freshman midfielder Drew Schantz looked good in transition. Cole Ricardi scored on a nice pass from Gray to put the Irish up 6-3. Cue the band as a middie line of Pierre Byrne, freshman Brooks Tyrrell and Kyle Trolley entered. Byrne’s first step with the ball is electric. Enter freshman midfielder Nick Stinn with 7:36 left in the half. Your attack now included Wynne, Garnsey and junior Anthony Marini. Bobby Gray had two goals and an assist. 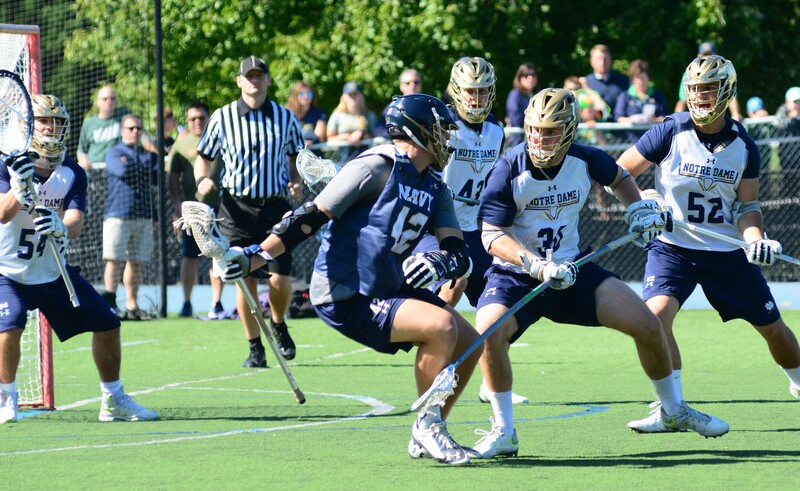 After Navy closed to 6-4, Garnsey scored his second goal on a low shot through traffic the Navy netminder didn’t appear to see to extend the Irish lead, 7-4. Junior Shane Doss relieved Molloy in goal, as graduate student Carl Walrath stepped in at attack. The half ended with the Irish leading 7-4. 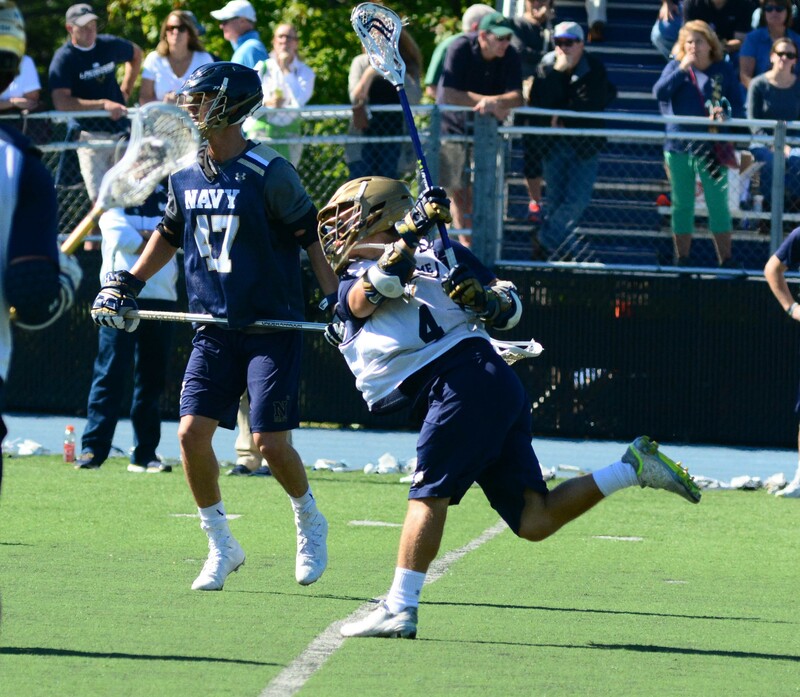 The second half began with a Navy long pole firing a blistering shot to close 7-5. 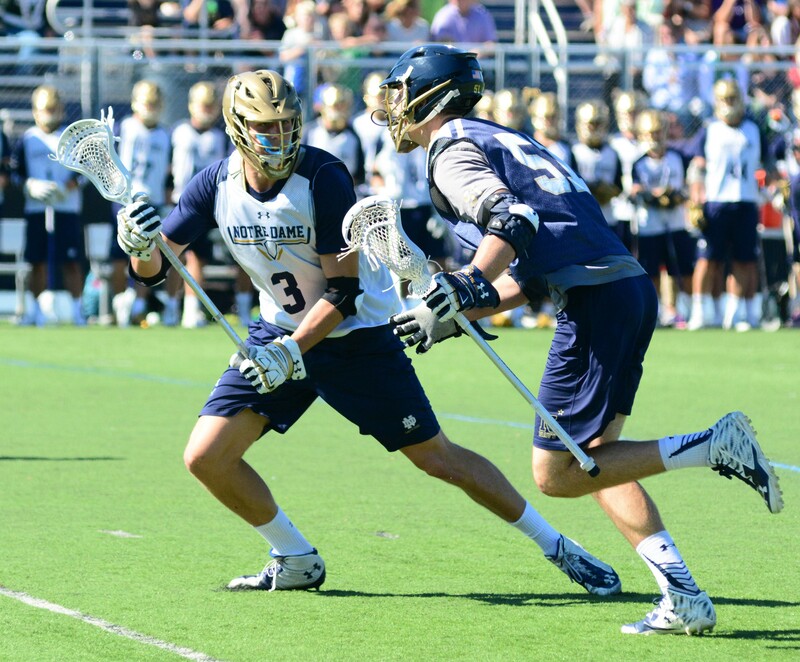 Bobby Gray responded with his second goal, with junior All-American Sergio Perkovic scoring as well to put ND up 9-5. The midfielders in particular looked fleet. With 4:32 left in the third quarter, graduate student Connor Kelley tookover in goal. CK made two saves early, one high off the helmet, a second down low, before Navy would score to close again, 9-6. Brendan Collins got that back with his third goal on the day, giving the Irish a 10-6 lead. Ryder Garnsey picked up the assist from behind the net. Freshman Timmy Phillips scored his first goal. The Irish ended the quarter with one more tally, bringing the score to12-6. The tradition continues…Landis, Glazener and Epple were smothering. Junior Anthony Marini scored twice in the fourth. 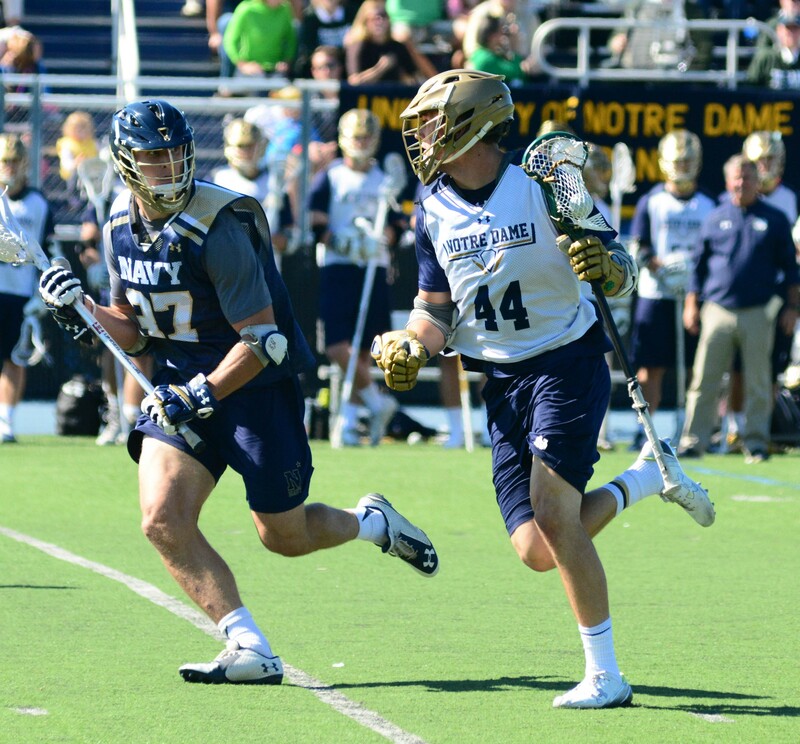 LSM Hugh Crance was on the field to start the fourth quarter as Navy snuck one far side, 12-7. Junior attack Liam Kennedy was on the field when Anthony Marini took a clever pass from Trevor Brosco and went far post for his first goal, 13-7. Enter freshman midfielder Brendan Gleason, who fed Marini open in the slot for his second goal, 14-7. Give the band credit, they kept the tunes coming. CK made two more saves before Navy scored. Kyle Trolley answered with his second goal, 15-8 ND. Sophomore John Travisano was now handling faceoffs. Navy scored last to end the game at 15-9. A fifth quarter began with freshman Michael Marchese in goal. Cheese made two saves early en route to pitching a shutout. Ben Pridemore and Brooks Tyrrell scored for the Irish. Chris Carter added depth on defense, while Tyler Ruhle showed hustle at attack. My apologies for players that I missed. My vision and voice to text would not have scored well on the beep test. An overflow youth clinic, led by local and Major Lacrosse League All Stars, followed the game’s conclusion. Instruction came from some of the game’s best in one of the nation’s most vibrant lacrosse markets. 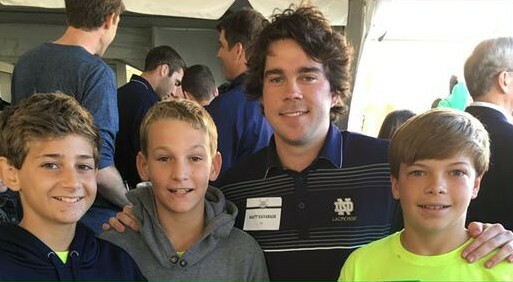 The Irish will conclude fall lacrosse this weekend with the traditional Steak And Hotdog Showdown at Arlotta Stadium. Senior Matt Kavanagh was kept busy all weekend. Special Thanks to the Bob Kemp Classic Committee for all of the efforts put forth. Neil Alt, Steve Collins, Kevin Corrigan, Quinn Cullen, Kevin Giblin, Marty Irving, Ted Moon, Jack Railey, Chris Rimorin and The Kemp Family launched the inaugural event to honor a legacy. Bob Kemp’s spirit will follow this team and community eternally. Use this link for additional information on The Bob Kemp Classic. My personal thanks to Kathy Koshansky for her generous supply of photos. See you Saturday. Go Irish! 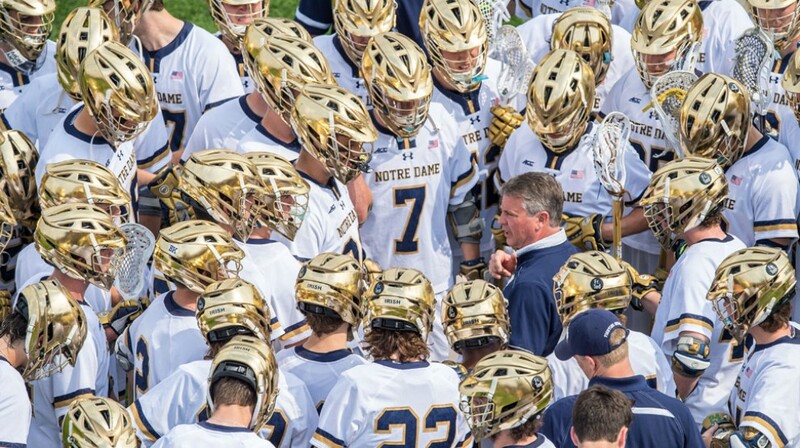 This blog follows Notre Dame lacrosse and is primarily aimed at parents, supporters and extended family. Content will be equal parts news and information about the team and parental planning for the season's high jinks. Glad to have you visit our blog.